All the Birds in the Sky reads like an instant classic. It soars through magic and science, good and evil and all the shades in-between; through the struggles of children against clueless parents, teachers, and spiteful kids, and the struggles of adults against a heedless society, with a love story at its heart. All the Birds explores big questions: What is really important? How are we all connected? Yet the book comes in at a weightless (and witty) 300 pages that simply fly by. I hope it takes off the way it deserves. 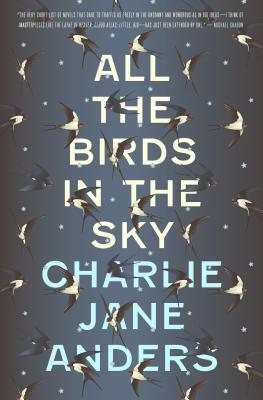 Charlie Jane Anders is the author of All the Birds in the Sky, which won the Nebula, Locus and Crawford awards and was on Time Magazine's list of the 10 best novels of 2016. Her Tor.com story "Six Months, Three Days" won a Hugo Award and appears in a new short story collection called Six Months, Three Days, Five Others. Her short fiction has appeared in Tor.com, Wired Magazine, Slate, Tin House, Conjunctions, Boston Review, Asimov's Science Fiction, The Magazine of Fantasy & Science Fiction, McSweeney's Internet Tendency, ZYZZYVA, and several anthologies. She was a founding editor of io9.com, a site about science fiction, science and futurism, and she organizes the monthly Writers With Drinks reading series. Her first novel, Choir Boy, won a Lambda Literary Award.